Longtime Shakespeare enthusiast and Gilchrist Elementary School teacher Ginny Stewart is responsible for bringing Shakespeare into Gilchrist classrooms. Photo by Johnston Roberts. Ginny Stewart’s classroom bustles with excited children. Little hands grasp pencils and crayons, sketching out words and coloring hand-drawn images of Hermia and Lysander. Having just read a few pages of A Midsummer Night’s Dream, Stewart’s second-grade students are hard at work on their individual Shakespeare portfolios. While many people begin to read Shakespeare later in life than Stewart’s second graders, the Gilchrist Elementary School teacher believes that introducing Shakespearean literature to young children can be highly beneficial to them. A longtime Shakespeare enthusiast, Stewart acted on her passion — and the inspiration she found in renowned author Lois Burdett’s “Shakespeare Can Be Fun!” children’s book series — and wrote a proposal for a “Shakespeare Can Be Fun” grant, which she received. The funds she acquired allow the 2nd–5th grade teachers at Gilchrist to incorporate a unique Shakespeare curriculum into their regular school-year syllabus. The curriculum encourages students to think critically and to develop their character, all while they learn about topics such as respect, social skills and friendship. The students’ portfolios are chock full of travel logs, poems and illustrations that depict the different acts of A Midsummer Night’s Dream. Stewart exudes pride as she walks around her classroom, eyeing her students’ work. “When it’s time for Shakespeare, they can’t wait to get on with the story and then compose something creative. They present with confidence and pizazz,” she says. 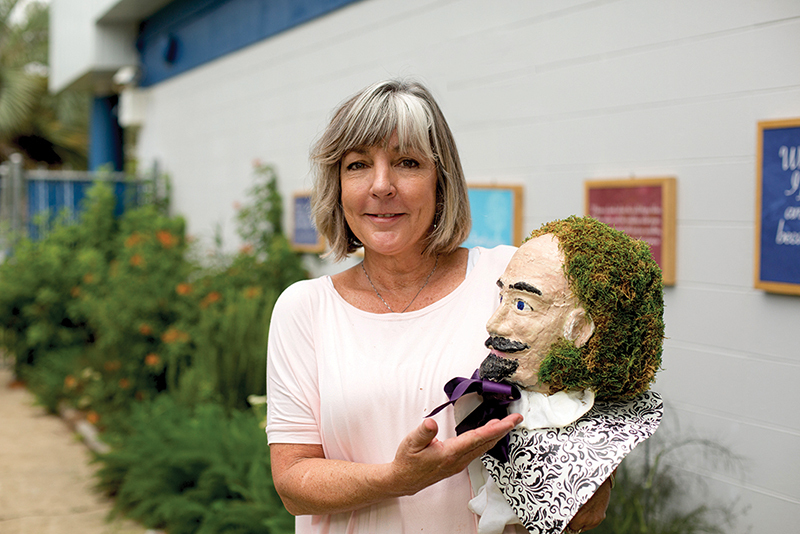 Stewart, her students, and the other teachers and students who are involved in the “Shakespeare Can Be Fun” program have also nurtured a “Shakespeare Garden,” which is located just outside of their school. The garden is filled with mint, pineapple sage, sweet potatoes and bountiful flowers, and students are eager to point out and discuss each plant. Cypress-framed canvases that display different Shakespearean quotes line the garden’s perimeter walls. To encapsulate the end of the school year and show off their Shakespeare portfolios, Gilchrist students hosted a Shakespeare Literacy Cabaret in their special Shakespeare garden. Guests were encouraged to attend the performance of A Midsummer Night’s Dream that was presented by the Leon High School Thespians directly after the celebration. Stewart has paved a path — a path that allows young children to grow and expand their minds in unimaginable ways. Acknowledging students’ abilities to be creative, enthusiastic and inquisitive at a young age is key to this new curriculum. Great things will sprout from this program, like the plants in the school’s beautiful Shakespeare Garden. Flora-inspired quotes from William Shakespeare’s works line the walls of Gilchrist Elementary School’s Shakespeare Garden. Sidney Pascoe and Ava Zupofska, both 8 years old, display lines from Romeo and Juliet and A Midsummer Night’s Dream. Photo by Johnston Roberts.